In case you’ve been stuck in a toy chest, Toy Story 3 is one of the biggest hits of the year. To celebrate the movie’s success and to pay tribute to one of America’s favorite franchises, why not throw a Toy Story Party? It’s easier than you think. Decorating is simple, just make the party room look as much like a kid’s room as possible. If you have kids, or if you rent or borrow some, have them draw pictures with crayons. Hang the pictures on the wall but make sure that they’re hanging at funny angles. You can also put up Space Ranger and Cowboy posters like the ones Andy has in the movie. Streamers are a colorful decoration that you can put up to add a little bit of playfulness to a room. Toys don’t eat, but your guest certainly will want to. Start with toy themed foods like these awesome Play Dough Cookies. Other good snacks to set out include colorful candies like Skittles and M&Ms, and general party food like chips and salsa (not everything you serve has to be toy themed). If you want to serve pizza, you can make your own box or at least just tell everyone that it is delivered from Pizza Planet, Andy’s favorite pizza place in the movie. You can also serve burgers, hot dogs or french fries with alien (green) ketchup from Heinz. If you’re feeling up to it, or if there aren’t too many guests, you can have each person make their own Mr. Potato Head. This involves buying several potatoes, luckily they are cheap, and baking them before hand. Using different toppings you can make pieces to add to the potatoes. Olives can be used for eyes, sour cream can make a toothy smile, and a nose can be made out of a piece of green onion. These are just a few examples and you can probably think of more. This also makes a great activity if you need something for the guests to do for a few minutes. There are lots of activities that you can plan for a Toy Story Party, and most of them are inexpensive as well as fun. Print up a blown-up picture of Woody. You can do this at a print shop, or you can enlarge the image on your computer and print it out onto several sheets of paper. Hang the image on the wall. In order to protect your paint or wall paper, consider mounting the image on a piece of wood or cardboard. Give each of the participants a paper badge, have them write their name on it, and then blindfold them and see if they can stick the badge in the right spot with a piece of tape. Be sure to place Woody at an appropriate height for your guests. This activity may cost a little more than the others, but you can do it with only one Etch A Sketch if you want to save money. Have an image, an easily recognizable character like Woody or Buzz works well, that everyone can try to duplicate. You can set-up the Etch A Sketch at a table and have guests come and try their hand at making a copy throughout the party. The goal is to Etch the best recreation of the image. You can leave a camera at the table so that people can record their work. Having a prize for the best drawing is a great way to get people to participate. Remember those little Green Army Men from when you were a kid? If you’ve still got them, now is a great chance to use them for a fun game. If you don’t have any, they are readily available at toy stores and online. Designate an area, either a room, an enclosed yard, or the whole house, as the area for the game. Before the party guests arrive, hide as many army men as you want in the area. The more army men you hide the longer the game will take. Have each person collect as many army men as they can, with the winner getting a prize. You can also have the contestants keep the army men, meaning that the most successful hunter will get the most army men. No Toy Story party would be complete without a visit from the Buzz or Woody. These Buzz Lightyear Costumes and Woody Costumes are perfect for a guest appearance, and there are also plenty of other Toy Story costumes available if everyone wants to dress up. It sounds like Pixar has another hit on their hands, and if you haven’t seen the movie yet I highly recommend that you make it a part of your weekend plans. If you’re in the mood to celebrate Toy Story 3’s success, we have everything you need to throw the perfect Toy Story party. Toy Story part supplies include Toy Story plates, Toy Story cups, Toy Story napkins and more. Of course you can’t forget the Toy Story 3 costumes. The most popular items, like Sheriff Woody costumes, Buzz Lightyear costumes and the Green Army Man costumes are selling like crazy, so order yours before it’s too late. Toy Story costumes are selling like hotcakes, so we’re going to keep on rolling with our profiles of the Toy Story characters and their costumes. Today we’re look at Jessie, who is voiced by Joan Cusak. Jessie has, along with Woody and Buzz, one of the most recognizable and popular Toy Story costumes. Her classic western style makes her a great choice for any young girl looking for a Halloween costume. Jessie is different that the other characters from Toy Story that we’ve profiled so far because she didn’t make her first apperance until Toy Story 2. Jessie also doesn’t start out as one of Andy’s toys, instead, Woody first meets her after being captured by Al McWhiggin, the owner of Al’s Toybarn. We’ve got lots of other Toy Story costumes at CostumeCity.Com. Check out all of our costumes and costume accessories. If there any Toy Story characters that you want to know more about, leave us a comment and we’ll be sure to profile them before the movie comes out next friday. 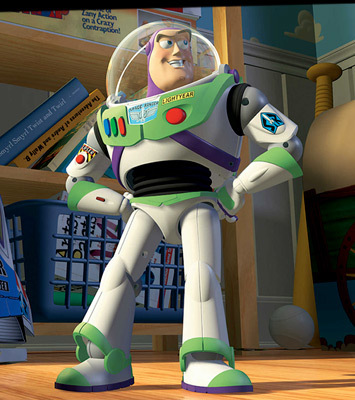 Buzz Lightyear originally appeared in the 1995 release of Disney’s Toy Story. Since then he has gone on to appear in the two subsequent Toy Story films, his own feature film, a TV show and he ventured into space for a stay on the International Space Station. Buzz Lightyear was given to Andy (who owns all of the toys in Toy Story) as a gift for his birthday. After being unwrapped, Buzz insisted that he was the real Buzz Lightyear, not a toy. Conflict immediately arose between Woody and Buzz because it appeared that Buzz was taking over Woody’s spot as Andy’s favorite. This conflict eventually escalated and led to Woody and Buzz being trapped in Sid’s house. After seeing his likeness on a TV commercial, Buzz realized his true identity and become depressed. He eventually overcomes this depression to help save Woody from Sid. Buzz’s rise in populartiy eventually caused him to outgrow the Toy Story franchise, and he went on to star in his own movie, Buzz Lightyear of Star Command, and in his own similarly named TV show. The spin-off movie and TV show both follow the real Buzz Lightyear on his mission to stop the Evil Emperor Zurg. Following the success of his show, Buzz got a chance to actually go into space aboard the Discovery Space Shuttle. Buzz got to stay aboard the International Space Station for 6 months as part of the educational NASA program Toys in Space. Buzz’s popularity stems from his ability to connect with a large age group. His toy-like nature gives him appeal with younger children, and the space ranger motif makes him interesting to older children. This combination gives Buzz a certain cool that the other Toy Story characters don’t have. We’ll have to see what kind of adventures Buzz gets into in the new movie, but in the meantime check out these Buzz Lightyear costumes. Only a few days left until Toy Story 3 hits theaters. Keep checking back for more profiles with interesting tidbits about your favorite characters. Don’t forget to check out CostumeCity.Com’s Toy Story costumes for everything you need to get ready for the new movie. Toy Story 3 comes out in a couple of weeks, so we’re going to look at the characters that have made this movie series so memorable. First up, Sheriff Woody. 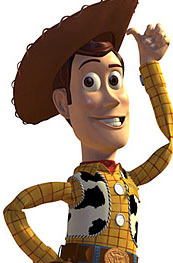 Woody has been the Toy Story protagonist since the first Toy Stoy movie was released in 1995. Woody’s costume has become iconic due to the success of the movies, but his voice has always been what fans recognized the most. Tom Hanks provides the voice of Woody, and he agreed to do the part after a short clip was put together featuring Woody with a voice-over from one of Hanks earlier movies. This was Tom Hanks first appearance in an animated film. 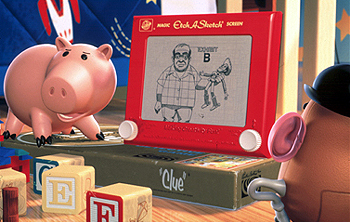 Woody has always been a do-gooder, and he was the fearless leader of the toys before Buzz’s arival. He continued to be the voice of reason as the other toys were wowed by Buzz’s laser and impressive wing-span. What makes Woody a great character, and a character that you can base multiple movies around, are his flaws. Woody has a prideful streak, and along with that a jealous streak, that continually gets him into trouble. The audience knows that Woody has a good heart, and his struggle to overcome his pride creates the conflict that makes Toy Story such a great movie. Enough with the philisophical analysis though, check out all of the different iterations of the Woody costume. There are lots of great Woody Costumes available, and you can make your own without too much trouble. Toy Story costumes are great for groups or couples because the characters are so memorable. Check out Costume City for more great Toy Story costumes for the release of Toy Story 3. If you're still shopping for a Halloween costume we have a special coupon for fans of the Costume City Facebook page.